New from the UK's most renowned and respected brand in paintwork restoration - T-Cut Original Metal Polish. 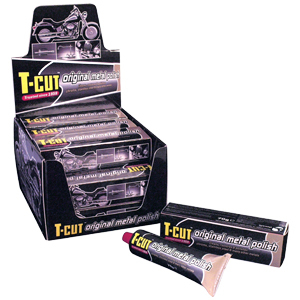 T-Cut Original Metal Polish cleans, restores and polishes chrome, brass, stainless steel, nickel copper, aluminium, alloy and many other metals. It will cut through any surface corrosion and oxidisation to restore a brilliant shine and lustre, even if the metal hasn’t been cleaned for years! Available in 100g tubes with a stylish, high impact counter display unit, T-Cut Original Metal Polish will also protect against tarnishing and discolouration and is suitable for all manner of applications including automotive, motorcycles, marine, sports & leisure, domestic appliances and general home use.